Milwaukee M12 FUEL takes 12V to the next level of performance with a POWERSTATE brushless motor, REDLINK PLUS Intelligence and REDLITHIUM battery technology for exceptional motor life, run time and power. Hard-working and long-lasting, the POWERSTATE brushless motor reduces noise and cools rapidly to deliver years of maintenance-free performance. The M12 REDLITHIUM XC4.0 battery provides up to four times more run time than standard Li-Ion batteries to power through any job. Featuring an advanced system of cordless power tool electronics, the REDLINK PLUS hardware and software help maximize performance to protect your investment. The 2693-22 M18 Cordless Lithium-ion Two-Piece Combo Kit includes a 3/8-inch Compact Impact Wrench with Friction Ring (2651-20) and Work Light (49-24-0171). The M18 Cordless Lithium-ion System's patented technologies and electronics, innovative motor design, and superior ergonomics provide the most efficient blend of power, weight and performance in the industry. Powered by REDLITHIUM, the M18 cordless system delivers more torque, more power, and longer runtime than the competition. 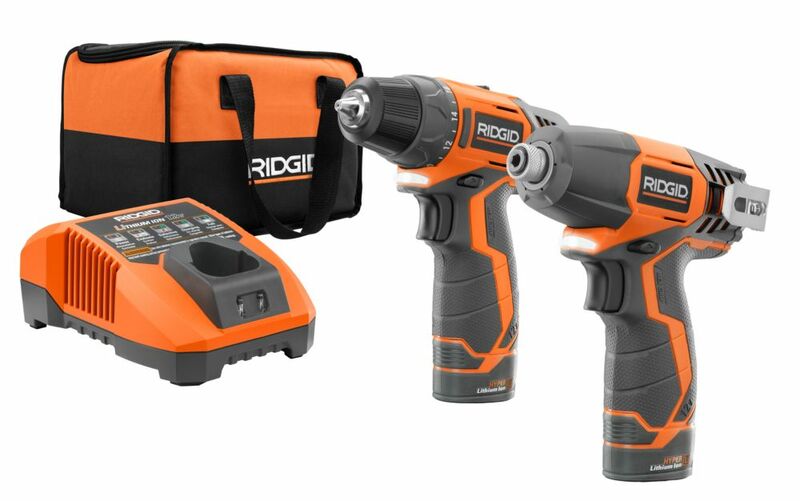 RIDGID introduces the new 12-Volt Drill/Driver kit. With the included Hyper Lithium batteries, you can get up to 50 percent work output compared to standard lithium. With free registration, this tool is covered for life, free Batteries, free Parts and free Service, for Life. Includes: R82005 Drill, (2) R82048 Hyper Lithium-Ion Batteries, R86049 Charger, Double Ended Bit, Bag and Operator's Manuals. RIDGIDs new JobMax system of tools is the ultimate in versatility. The 12V JobMax Multi Tool Starter Kit is a comprehensive fine detailing set that allows users the freedom of sanding and plunge cutting with the versatile easy to change multi tool power base. The best part is that you can use any brands accessories with the universal JobMax adaptor. The JobMax power base accepts the Multi-tool head as well as 4 others that are available with the launch of the program. Best of all they are backed by RIDGIDs Lifetime Warranty Service Agreement. This kit includes: R8223500 12V Jobmax Power Base, R8223408 Jobmax Tool-Free Multi-Tool Head, R82005 12V Drill/Driver, R82049 12V 2.OAh Hyper Lithium-Ion Battery, R86045 12V Charger, Wood Cutting Blade, Sanding Pad, Sand Paper Sheets, Universal Adaptor, Belt Hook with Screw, Driving Bit & Bag. 12V Hyper Lithium-Ion Drill/Driver and Impact Driver Combo Kit (2-Tool) with (2) 1.5Ah Batteries Compact, lightweight and powerful, the Ridgid 12V lithium-ion Drill and Impact Combo Kit features a two-speed drill/driver which is the strongest in its class with industry-leading torque (400 inch lb.) and variable speeds (0320/01300 RPM). This drill/driver is the most compact 12V available, with a full chuck and clutch which accepts all 1/4 hex and conventional round bits and it is ergonomically-designed to feel incredible in your hand as you work. The Tri-Beam LED lights provide optimum illumination and eliminate shadows on the work surface. 12V Hyper Lithium-Ion Drill/Driver and Impact Driver Combo Kit (2-Tool) with (2) 1.5Ah Batteries is rated 4.3 out of 5 by 35. Rated 5 out of 5 by Linda from great little combo I already had the set and love the compact size and they work great too, so I bought another for my son's birthday and he loves them too. Warranty is excellent. Rated 5 out of 5 by Alec from Awesome Amazing little drills. Easy to control and much more power than I expected. Never let me down yet. Rated 5 out of 5 by Hogmosh from Rigid They work well.Light weight. Great warranty! Recommended for home use. Rated 4 out of 5 by Claude 54 from Very easy to handle. Very pleased with the product and the warranty. Would highly recommend this product. Rated 5 out of 5 by LaGrenouille from what a deal This is a great little set, it is my second one which is about 10 years old. the batteries were getting a little tired, was just looking for batteries, the kit was cheaper than 2 batteries. The only thing I was disappointed in was in the advert.it showed that it had a square flat bottom battery. not true. But still a good deal. The pictures show 2 AH batteries, but the description states 1.5 AH. Is this still using only the 1.5 AH batteries? They are 12V batteries and have no amp hour data on the battery or the charger. The battery reads ' 12V 16Wh. With the conversion calculator, it would be 16Wh divided by 12 volts = 1.334 AH which is less than either of the advertised. This package is discontinued in the U.S. Is Home Depot Canada planning to upgrade its combo pack to match? I noticed the same thing as well today having just getting an LSA registration for the kit I purchased in December. I had a closer look and it appears that their discontinued US kit included the same 1.5 Ah batteries the current Canadian kit comes with. The new US kit seems to have the 2.0 Ah and the 4.0 Ah batteries which would be a nice touch. The thing that I was most concerned about was the charger. The new US kit has the same model charger as the current Canadian kit. This should permit for the larger batteries to be handled in it. How can you tell if battery runs low on either of these tools? I don't see a battery gauge or indicator lights on the side like some other models. The led will flash indicating battery is low.